Liquid Days? (Songs from) Liquid Days) is what? PG: Well, it’s a collection of songs I did. In a way, it’s kind of a problem to talk about because it was the first songs I did in English, and now, four or five years later, I’ve done a whole set of songs with Allen in English. And I wanted to do a set of songs using the English language, because I ‘d done..Satyagraha was written with…. ST: Well, Satyagraha was Sanskrit. That was quite a job for the performers. PG: Yea, that’s right. And Akhenaten was done in Ancient Egyptian . PG: And Einstein.. used..more and more used numbers. One, two, three, four. ST; And, actually, Laurie Anderson also did something for it. PG: She contributed lyrics for a song also. AG: And Jack Benny, wasn’t he..? ST: You’ve heard this before? AG: Yeah, I wasn’t aware of it, but , I immediately, as it got on..
ST: The sound, as we hear the sound..
PG: You mean how it ends? or..? ST: Yeah, I mean, just generally. I know the keyboards are electronic..
PG: Yeah..well, that’s a combination of electronic and acoustic.You heard a flute and there are strings, real strings, and a.. The way we recorded it? We reorded it in the studio. But we did do a tour. I got a little tour together, and I toured.. (it was a little mini-tour, we did Europe, San Francisco and Los Angeles. But on the record, I also had …Linda Ronstadt sang on the record and she came on tour, the Roche Sisters came on, Doug Perry, who was also on the record. So it was..
ST: And I thought, here we go, World War II, the ‘Forties, the Andrews Sisters, much has happened technologically in so many ways. And the Andrews Sisters, the Roche Sisters you have the history of America of the past forty years. PG: David Byrne’s from Baltimore, by the way. He grew up in Baltimore. PG: Well, I play some solo piano, and Allen reads some poetry. AG: Well, the latest in scientific information is that when two molecules clank together, it takes an observer for that to become scientific data. So it all comes back to subject. AG: So when’s Earth Day? 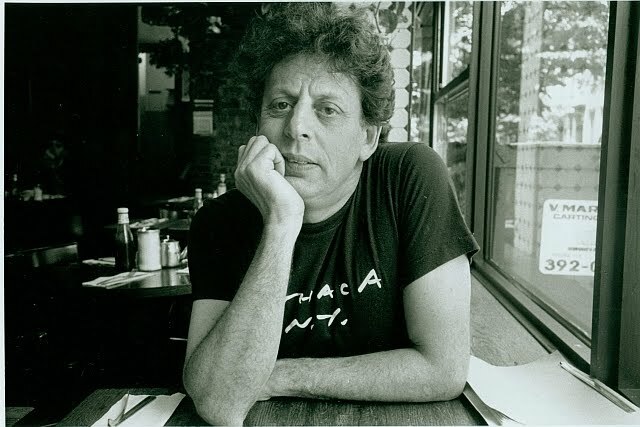 ST: Just to remind.. Not to interrupt but to remind listeners that Allen Ginsberg (who we’ve been hearing) and Philip Glass, together – that’s tomorrow-night, and you can see, it’ll be.. there’s a spontaneous air to this, and a refreshing one too. At the same time there’s a theme, and the theme is the one we’ve been talking about really – it all begins with you (there in the audience). Center East – because they’re.. under the auspicies of, or rather for the benefit of a Buddhist organization, Jewel Heart, and Center East is the place, Center East at 7701 Lincoln in Skokie. So that’s eight o’clock tonight. ST: Acoustic piano too . This is a piece that was identified with a movie called The Thin Blue Line. It’s a film about a man who was put into jail for a crime that he..apparently he hadn’t committed at all – a guy named Randall Dale Adams – and a filmmaker named Errol Morris stumbled across this case and began interviewing people and filming it and, as a result of the film, the guy was actually released, and the real killer confessed. During the..
Any connection here with the (Franz) Kafka theme? PG: Well, I also use some of this music for a staging of the Kafka play, and, in a way. I thought the whole thing that happened to Randall Dale Adams.. In the Kafka, there were a lot of reverberations that seemed to me very authentic. ST: You haven’t set Kafka yet, have you? PG: No. no I haven’t, but I’ve done music for it, plays that were based on him. AG: Well, that would really be up your alley, in a funny way. PG: You know I’ve finally worked with (Edgar Allan) Poe. I’ve set Poe, and I find…. ST: Oh, “The Fall of the House of Usher”, you did “(The) Fall of The House of Usher, did you? PG: Yes, that’s right. Yeah, and that.. maybe because I was from Baltimore, but that.. in a way, Poe was such a forerunner of much modernism, so I felt very at home with it. ST: This is a slow reluctant playing, very reluctant, because you can see it building. And you’ll hear some of this tomorrow-night. There, Philip Glass at the piano, and that was certainly.. several of these pieces….